We need to see some pictures of '18's being uncrated! I haven't seen any yet. My buddy is the sales manager at Douglas Motorcycles in San Bernardino CA. I'll tell him I want to be there for the uncrating of my bike to record. Thanks, there is something so cool about that. We know what it looks like, but seeing it out of the crate adds something. Kinda' like lingerie, you know you're going to just take it off and it ends up on the floor, but unwrapping it sure is fun! Lingerie, all the way from Italy to boot . . .
Have the four strokes started showing up as well? No, they're saying end of August. I should be getting one of the first ones since I'm close to the Beta headquarters in Paso Robles, CA. I'll be doing an uncrating video so stay tuned. No way! They're in my backyard (so to speak)? Wow I didn't know Beta was in San Bernardino. That's only a few hours from me lol. I just got mine. Only road it round the yard. 2017 parts fit, except skidplates..............thats what I got from Beta USA so I slapped some 2017 radguards on. I have a drunken inappropriate video too I sent to all my jealous buddies, with my best "Bahstn" accent......but I dont know how to post vids on here. Got it. Yeah I'd like a new bike someday, hopefully they'll still be making 300 smokers by the time I can afford one lol. Betas look pretty cool, lotsa guys are buying them I've seen. Spoke with a few dealers today. 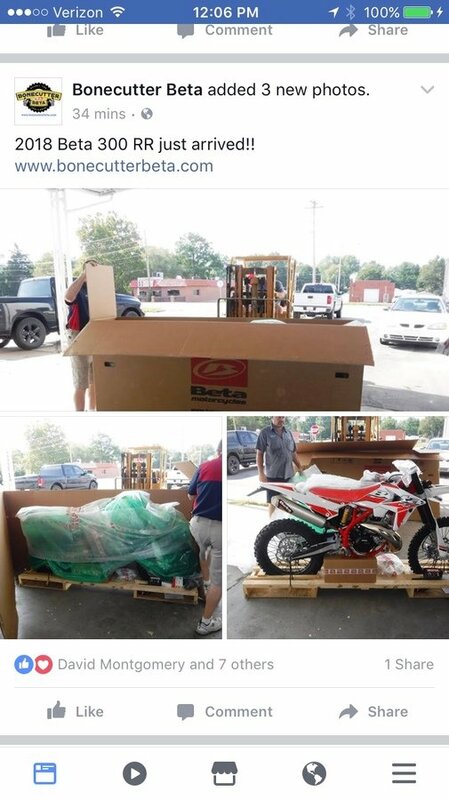 They said the dual sport bikes aren't shipping out to the dealers yet...they were supposed to this week. It seems to be that they're held up in C.A.R.B and won't ship out for two more weeks at least. Nice. We both go to the same dealer. Strange to see it with no bikes/stuff outside. Good to see other Beta owners up here. Got word from my dealer (Douglas Motorcycles in San Bernardino) today that my MY18 500 will be showing up the 2nd week of October!!!! He said I'll be one of the first in California to take delivery! Stay tuned for an uncrating video!! !